Hi MariaElizabeth , I would like to speak with you briefly to see if you're a good fit to coach me. Please contact me at your earliest convenience. 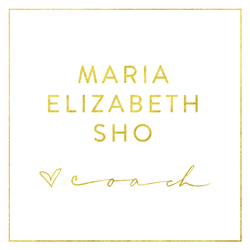 I'm Maria Elizabeth Sho, Certified Intimacy & Relationships Coach. With more than two decades self-development experience gleaned from certified training, workshops, retreats, and practice, I continue to strive to help people create a world of meaningful connection, beautiful relationships, and powerful intimacy. While I am passionate about creating deeper feelings, I’m also committed to understanding how the mind-body work and how this affects the way we perceive and experience our life. Although my work is influenced by some big names like Layla Martin, Esther Perel, Kim Anami, Stan Tatkin, Brene Brown, Emily Nagoski, Byron Katie, Marshall Rosenberg, Hellinger Family Constellations, Gary Chapman and others. I give credit to my many clients that let me be part of their journey and have enriched my practice so is grounded, tailored and of service. I often get asked why I do what I do, and my answer is always simple; I love helping people create happier and lovelier relationships and also discover how to have and enjoy an amazing intimacy. Having faced and conquered sexual trauma and terrible relationships myself, I’m convinced that everyone deserves to experience true love and live an extraordinarily fulfilled life. I believe that nobody deserves to keep getting the same pattern in their relationship. I believe that we can get reconnected to our partners even after those heart-wrenching arguments. I believe that everyone deserves to feel more confident with intimacy and experience lasting desire. As a dedicated intimacy expert, I don’t stop working until my clients achieve their desired results. Have you worked with MariaElizabeth ? Tell your friends! MariaElizabeth doesn't have any reviews yet. MariaElizabeth hasn't submitted any articles.